Jim Brunner of the Seattle Times wrote a story detailing a disconnect in what oil and gas industry officials say publicly and how they’re responding to Gov. Jay Inslee’s cap-and-trade proposal. Industry officials say they support cap-and-trade, but they’re no fans of Inslee’s proposal or of what’s happening in California. When asked what kind of proposal they would favor, they don’t offer specifics. Included with the story, however, is a chart that is useful, but illustrates how easy it is to make a false equation in politics. The chart shows that state Sen. Tim Sheldon, D-Potlatch, has received more campaign money from oil and gas interests than all but one other legislative politician in the state. State Sen. Jan Angel, R-Port Orchard, comes in at No. 8 for donations she received for her 2013 campaign. Here is a list of the oil and gas industry contributions that went to Kitsap candidates in 2013 and 2014. The easy accusation is to say that a legislator, once gifts are offered, is paid for. I won’t argue that money has no influence, but its bigger influence is in who gets elected, not in what the politician does once in office. To illustrate that point, let me ask you this question: If the oil and gas industry hadn’t contributed $13,700 to Tim Sheldon’s campaign, do you think he would then favor Inslee’s proposal? I seriously doubt it. If you doubt me, do you think that same amount of money would have influenced Irene Bowling’s vote? I could give you new evidence about the impact of money and politics, but instead I’ll give one I’ve offered before. Barney Frank: People say, “Oh, it doesn’t have any effect on me.” Look, if that were the case, we would be the only human beings in the history of the world who, on a regular basis, took significant amounts of money from perfect strangers and made sure that it had no effect on our behavior. That is not human nature. Andrea Seabrook: On the other hand, he says, there are things that influence a politician besides money. Barney Frank: If the voters have a position, the votes will kick money’s rear end any time. I’ve never met a politician — I’ve been in the legislative bodies for 40 years now — who, choosing between a significant opinion in his or her district and a number of campaign contributors, doesn’t go with the district. And I have had people tell me — and we talk honestly to each other, we don’t lie to each other very often. You don’t survive if you do. As chairman of a committee, I’d be lobbying for votes. I have had members say to me, Mr. Chairman, I love you. Barney, you’re right. But I can’t do that politically because I’ll get killed in my district. No one has ever said to me, I’m sorry, but I got a big contributor I can’t offend. I’m not defending anyone here. I’m just suggesting that the oil and gas industry ponied up money for Tim Sheldon and Jan Angel because they knew Tim Sheldon and Jan Angel. I don’t think either has ever shown any sign of being a fence sitter on cap and trade. Just kidding. You’re not really invited. Washington Gov. 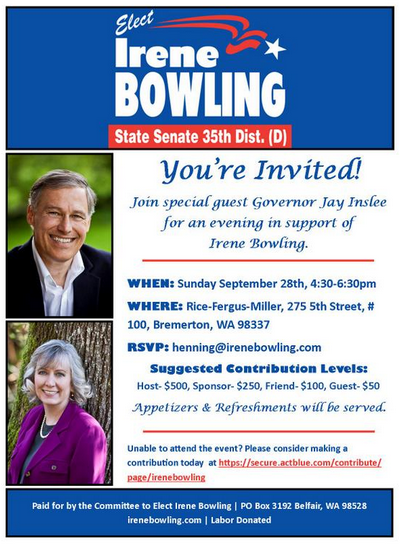 Jay Inslee was scheduled to be in town on Sunday for a campaign fundraiser for 35th Legislative District Senate candidate Irene Bowling, a Democrat. We asked permission to go, but were informed the event at the Rice Fergus Miller building in Bremerton was closed to the press, not unusual for a fundraiser. We were disappointed, though, because we had an invitation. It was sent to us via Twitter from the 35th Legislative District Democrats. We should have been suspicious, though, because Twitter is unreliable. Remember, it was on Twitter that we first read that Dewey defeated Truman. Suggested contributions for the fundraiser ranged from $50 for the “guest” level to $500 to be considered a “host.” While “guest” sounds right for me, $50 does not. Inslee’s presence demonstrates his interest in seeing the state Senate taken back by Democrats, and Bowling’s race is against Tim Sheldon, a Democrat. Let me explain. He is a Democrat, but caucuses as a Republican, a reality that demands two weeks’ time for Washington State Civics teachers. In English class it makes for a complicated sentence diagram with lots of subservient clauses and semicolons. To get a Democratic majority Inslee is being aided by California billionaire Tom Steyer, who this week dropped $1 million into a committee, NextGen Climate Action Committee-Washington Sponsored by Tom Steyer. Steyer’s organization followed that with a news release saying it will target 25 percent of the voters in Washington. He’s doing the same in Oregon. NextGen Climate will focus on races where there is an opportunity to discuss climate issues with voters, including, but not limited to supporting Tami Green in the 28th Senate District and Matt Isenhower in the 45th Senate District. Whether any Steyer money finds its way to the 35th depends on party polling, which will reveal whether voters in the district are bucking the common assumption that voters who picked Republican Travis Couture in the primary will mostly side with Sheldon in the general election, since Couture was eliminated from the race. Sheldon thinks he’ll pick up most of Couture’s voters because he is more conservative. Bowling believes she will get most of the Couture voters, in some part because she is not Tim Sheldon. An earlier $250,000 contribution to an independent committee set up to campaign for Bowling made some think there were signs Bowling could beat Sheldon. That changed when $225,000 was returned, leaving some to wonder what the polling says now. As of Friday Bowling had raised about $150,000 and still had about $55,000 of that unspent. Sheldon has raised more, about $290,000, and has about $100,000 left to spend. A word or two from the governor might close the gap at least a little. Steyer money coming our way again? I don’t take lightly posting pictures from other publications, but in this case the New York Times story and photo have direct relevance to our area. And I really, really, really want you all to read the story, so click on the link. For months Republicans have been warning about the “Ramtha money” referenced in our story about the late money into the 35th Legislative District primary. The New York Times focused on our state this week and this is what I took from it: The racist rants (taken out of context or not) of an ancient enlightened one that helped a Yelm woman make a sizeable enough living to fund Democrats can make for campaign indignation, but that money isn’t anywhere near the GOP’s biggest problem this year. Mr. Inslee, who is campaigning for his agenda across the state this summer with oyster farmers in tow, is trying to position himself as America’s leading governor in the climate change fight. But Mr. Inslee does not have the support of the majority of the Washington State Senate, particularly those conservative lawmakers from the rural inland, so Mr. Steyer’s advocacy group, NextGen Climate, is working with the Washington League of Conservation Voters to handpick Democratic, pro-climate policy candidates across the state. Steyer plans to spend about $100 million across the country to elect politicians who see it his way on climate issues and to oust those who don’t. A fair share of that will come here to Washington, and the Times speculates the candidates he chooses, working through the Washington League of Conservation Voters, will see hundreds of thousands of dollars going either to support them or against their opponents. This gets to another reason I posted the picture. You see Inslee walking the beach with Bill Dewey of Taylor Shellfish Farms. Dewey, according to Public Disclosure Commission reports, gave Inslee $500 this year toward Jay Inslee for Washington, which we can assume is his 2016 re-election campaign fund. Dewey gave $1,250 for Inslee’s 2012 campaign and Bill Taylor from the same company gave $1,000. But both have also donated to Sheldon over the years. Dewey gave the senator $500 in for his re-election campaign in 2010 and another $500 in 2013. Taylor gave $250 in 2010 and $500 in 2013. Most donations coming from the Taylor company, primarily Taylor and Dewey, go to Democrats, and technically Sheldon is one of those. But you know the story; Sheldon caucuses with the Republicans, giving them the majority and lessening Inslee’s chances of getting his climate agenda passed. 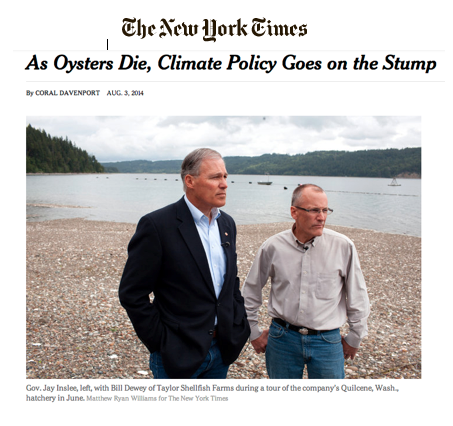 So Inslee has an agenda designed to benefit Taylor Shellfish, but someone who votes against Inslee’s agenda is their friend, too. Washington Conservation Voters has already endorsed Bowling in the 35th. Sheldon received a “0” score from the organization after voting for nine bills the organization considered bad for the environment and against three bills the group said were good for it. Sheldon’s lifetime score is 30. By comparison Christine Rolfes, a 23rd District Democrat, received an 83 for the session. Democrat Nathan Schlicher in the 26th received a 56 for his votes and Republican Jan Angel got a 25. So will Steyer go after Sheldon? That might depend on the polling. Someone is going to do some once the primary dust is settled. If Sheldon is not right in fact, in philosophy he is. Steyer will want to put money to races that are winnable, so he and his allies will decide whether to back Democrat Irene Bowling in the 35th and Judy Arbogast in the 26th. Steyer spent a lot of money against Jan Angel in 2013 and lost, but the Times story shows where he won, too, and those were not insignificant wins. Bowling saw the same numbers Sheldon saw and had a different take about votes for Couture and was not so agreeable to the idea that those votes would now go to Sheldon. “I think that Travis represents people that are fed up with government as it stands and they want change,” she said. Her hope is she can influence Couture voters to vote her way in the general election. An alert party operative who shall remain nameless told me recently, “The fights between parties are nothing compared to the fights within them.” Here we give you two examples, one from each party. The first fight is one those in Kitsap are more likely to know about, the one between supporters of Russ Hauge and those of Bob Scales. Hauge is the incumbent Kitsap County prosecutor and is a Democrat. Scales served two terms as a Bainbridge Island city councilman and works as an attorney for the City of Seattle. Tim Sheldon, whose name comes up later, doesn’t like it when Democrats say he isn’t one of them. There is no party registration in Washington, he’ll tell you. Even if there were, it isn’t like there is a test you have to pass for either party. But Democrats do have at least a little bit of justification for saying that about Sheldon, especially now that he caucuses with Republicans. “They caucus with me,” he responds. Fine. Same difference. On issues that divide Democrats and Republicans in the state Senate, Sheldon sides more with Republicans than he does with Democrats. It doesn’t make him a Republican, but give the Democrats credit here for arguing with some evidence. I’m not sure where they’re getting their evidence when it comes to Bob Scales. Debbi Lester says Scales is combative, short-sighted and mean-spirited, based on her experience as fellow member of the Bainbridge Island City Council. That might all be true, but neither party is immune from that kind of behavior. I covered the council for a year or so while Scales was on it his first time and couldn’t tell you based on that where his politics are. There is the bigger question of where that even matters when it comes to serving as prosecutor, but where Lester and others cast doubt on Scales’ cred as a Democrat come from the fact that the Kitsap Patriots Tea Party gave Scales a high ranking as a candidate. Quick, what does the Kitsap Patriots Tea Party stand for in a prosecutor? Yeah, I don’t know either. Still, I found it curious, so I contacted the organization to see if I could get a copy of the questions they asked and Scales’ answers. I got no reply. So we asked Scales if he would provide them. He did. I’ll post those below, after the other bit about in-party fighting. That comes from the race Sheldon is in. Sheldon received a $13,800 in-kind contribution for some polling from the Senate Republican Campaign Committee. (On Monday night I learned there was a last-minute contribution made to Sheldon by the same group. It’s for $5,126.59 and was given on Thursday.) Remember, he’s a Democrat. There is another Democrat in the race, Irene Bowling, who is not shy about questioning his Dem cred. He has received no other official Republican Party money. Travis Couture, the Republican in the race, received $2,000 from the Mason County Republican Central Committee, but that’s about it from official sources. Official communications from the state have gone out within the district from the state party backing other 35th District Republicans, but not Couture. Eventually, apparently that was July 31, Couture had had enough. So he sent a letter to Washington State Republican Party Chairwoman Susan Hutchison complaining. The text of that letter follows. After that is the response from the state party and then the one from Kitsap County Republican Party Chairman Chris Tibbs. After that you can we go back to the Democrats, with Bob Scales taking on the “Tea Party” issue. Crosscut launched Wednesday a series that will focus on swing districts. The first focus is on the 35th Legislative District Senate race. Knute Berger, Benjamin Anderstone and Robert Mak teamed up to provide a comprehensive look at the district as a whole and the race specifically. Some observers say the politically purple Mason County, once a blue stronghold, is trending redder. This may in part be due to the aging of the population — it has nearly twice the percentage of adults 65 and older as King County. It’s not alone in that. The entire Olympic Peninsula population is aging and has — and will continue to have — the largest concentration of seniors in the state, percentage-wise. These folks trend conservative, live on fixed incomes, are often change- and tax-averse. Mason County voters have been described as socially liberal but fiscally conservative, which seems to track with the drift of 35th district politics. The package looks at what it will take for each candidate to win and makes that case we have been making here, that for either of the challengers, Democrat Irene Bowling and Republican Travis Couture, to win they have to hope they can knock the incumbent, Democrat Tim Sheldon, out in the primary. Full disclosure: I make a brief appearance in the Robert Mak piece. If you’re watching the state political landscape and in particular the 35th Legislative District, you might have long ago stopped looking at the Senate race to focus on the campaigns being waged by two Republicans for the opportunity to unseat a Democratic incumbent. 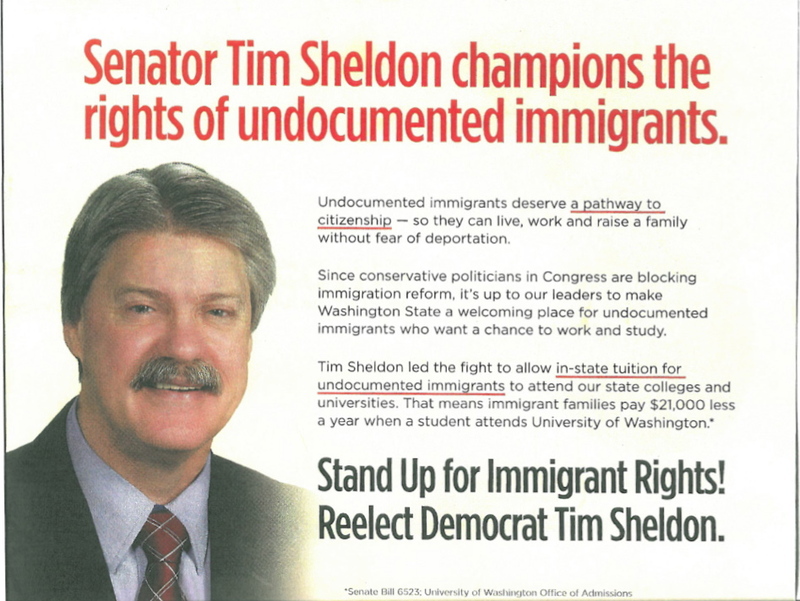 You might be assuming that Tim Sheldon will again open an unlocked door to another term as a state Senator. The primary, though, could be interesting. And Sheldon has made some critics out of people who once were his backers, primarily people in Belfair, because of his work as a county commissioner. Sheldon, as most of you know, is a Democrat, albeit (How should we put this?) an atypical one. For years his votes on most controversial issues have been aligned with the Republicans. The Democrats enjoyed their majority status in the chamber with his insistence on remaining a Democrat and have been safe from his maverick ways as long as the margin never got close. Once Democrats outnumbered Republicans by just three in the Senate, though, the GOP leadership was able to poach away control by nabbing Sheldon and Rodney Tom, the Democrat who once was Republican and is now the figurehead for the Senate Majority Coalition. In Mason County, which is the bulk of the 35th, Sheldon has held strong. In 2010 he received 57 percent of the vote against Nancy (grandma) Williams, though that big margin might be deceiving, because she didn’t wage much of a campaign. The election of 2006 might be a more telling picture. That year, one in which voters had to pick a party, Sheldon only received 43.1 percent in the primary against two challengers. One was a Democrat from the Howard Dean wing. The other was a Republican. In fact, the Democrat, Kyle Taylor Lucas, accused by many of moving into the district just to run against Sheldon, came in second place, netting 32.5 percent of the primary vote. Had she run in 2010 or this year and seen the same result, she would have been on the General Election ballot because of the state’s Top Two primary system. The Democrats have Irene Bowling so far. She has run a music instruction business in Kitsap County and has been well known locally. During the selection process for the county commissioner position left open by Josh Brown, Bowling proved herself a competent candidate. She answered questions well and swayed enough precinct committee officers to make her the second choice as Brown’s successor. I have little doubt that the vast majority of people who voted for Taylor Lucas in 2006 will side with Bowling this time around in the primary. If she gets more than the 32.5 percent Taylor Lucas got, she could even emerge as the 35th District’s first choice out of the primary. If that were to pan out, then the question becomes whether Couture can cut enough into Sheldon’s lead to do the unthinkable, putting Sheldon into third place. One of Couture’s challenges could be raising money for the race, at least from the state party. Party organizations get to donate in big amounts. Sheldon isn’t going to get money from either party, but he already has almost $80,000. Sheldon has in the past, though, prevented Republican candidates from getting GOP party money to run against him, or so I’m told. It’s as if every dollar he gets has a huge multiplier effect. It’s early in the game, but that could be tough for Couture. If he as a first-time candidate proves especially adept at raising money and getting signs on voters’ lawns, he could make it interesting. Where Couture might make his biggest splash is on social media, which doesn’t cost a lot and can have a big connector factor. If there is enough anti-Sheldon sentiment out there then this race could be highly entertaining. In the 2012 Mason County Commissioner primary race Sheldon received 29.4 percent of the vote as an incumbent, a half point ahead of the second-place candidate, Democrat Roslynne Reed. Sheldon won by 8 percentage points in the general election, but those 2012 numbers demonstrate he is not invincible. He does not enjoy the kind of support Norm Dicks had in the Sixth Congressional District. If you were betting money on the 35th District race, I still wouldn’t dissuade you from betting on Sheldon. But you might look at 2012 and have reason to question your certainty. If he makes it to the general election I don’t see him losing that one. The best chance to unseat him is likely the primary. Bowling, assuming she is the only Democrat who runs, will get the votes from those leaning left. The question will be how the conservative votes will split, whether Couture can effectively make the case that he is more their representative than the incumbent.